WCC picture day has been moved to Monday April 29th. Picture package information will be handed out on Tuesday (4/23). An email will also be sent out with this information please check your email. REMINDER that February 15 will be the last day to order a Parent T-shirt. Last day to fill out order form will be Friday, February 15thThe money will be collected during the first week of practice at RCK. 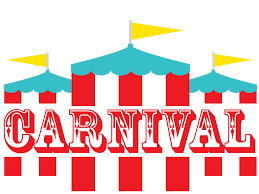 Rower and Parent Volunteers needed for the John Jay Winter Carnival on February 23. If you can help out please click on the link to the signup sheet. Thank you in advance. Description: ALL Novice and first time rower's MUST attend. Novice rowers MUST PASS SWIM TEST to row. The boathouse has indoor tanks which are two large pools of water with seats in the middle so the rowers can practice rowing. These sessions are set up for Saturdays from 12-2. There is an additional charge to use the tanks so we request that each rower bring a check for $25 made out to Wappingers Crew Club to the first session on January 5th. This is a one time fee. We are looking for donations of baked goods. Please label your donations "Wappingers Crew Club"
Thanks in advance for your contribution. Bake sales are an important part of fundraising. ​Please sign up for what you will be making for the School Bake Sales. Click Picture to sign up. ​Get a jump start on any holiday shopping! I will be donating 31% of all product sales to the Wappingers Crew Club!! Thirty one gifts has so many great products for the home, thermal items, organization and more. Most items can be personalized for $8 flat fee or $10 flat fee. All orders are scheduled with a direct ship to you. Please share the link with your friends, family, co workers. Great products and Great specials for the fundraiser!! If you would like to meet me on Saturday at the Guardian Storage Center, I will be there for the clothing drive and I can give you a Catalog so you can show friends and family during the Thanksgiving holiday!! All orders must be placed by Tuesday November 27th at 9 PM. If you have any questions or if I can help you with your order please let me know. ​Wappingers Crew Club annual Spring Clothing Drive. Save the date and help spread the word. Buffalo Wild Wings will donate 20% of your total bill. STADIUM! Click the picture for more information. ​The Novice team will need to attend. The race course begins on Onondaga Lake and continues 1500m through the Onondaga Lake outlet, passing the Syracuse University boathouse and finishing under the John Glen Bridge that spans the Seneca River. Coaches will let rowers know what time to be there. The race will start once all teams arrive at the Boathouse. ​Rowers, please check with your coach for the time they want you there. Heat Sheet lane assignments have now been posted. America's Largest Sprint Race. Featuring 10 lanes of 1500 meter racing and Attracting the top crews of the Northeast, Mid-Atlantic, and MidWest. A Clash of Titans as the Scholastic teams and non-scholastic teams race head to head for an early season peek at the high school rowing landscape of the Northeast. Memory Makers will be at the Boathouse during practice (5:30 PM) to take Individual and team pictures. ​​"Wappingers Crew Club Annual Spring Clothing Drive"
This is a special Crew Shuttle bus and NOT your normal bus. DON'T MISS THE BUS. The first practice up at the Boathouse will be Monday, March 19th. Please refer to times below. Coaches will let rowers know if there are Saturday practices. The Annual viewing of the USRowing safety video will be this Friday, March 16 from 3:30-5:30 in the RCK cafeteria. ALL rowers are to report to the cafeteria. The first practice of the season will be Tuesday, February 20th. Please refer to times below. PLEASE NOTE that these are practice times while at RCK High School. Times might change when we move practices to the boathouse. The boathouse has indoor tanks which are two large pools of water with seats in the middle so the rowers can practice rowing. These sessions are set up for Saturdays from 1-3. There is an additional charge to use the tanks so we request that each rower bring a check for $25 made out to Wappingers Crew Club to the first session on January 13th. This is a one time fee. 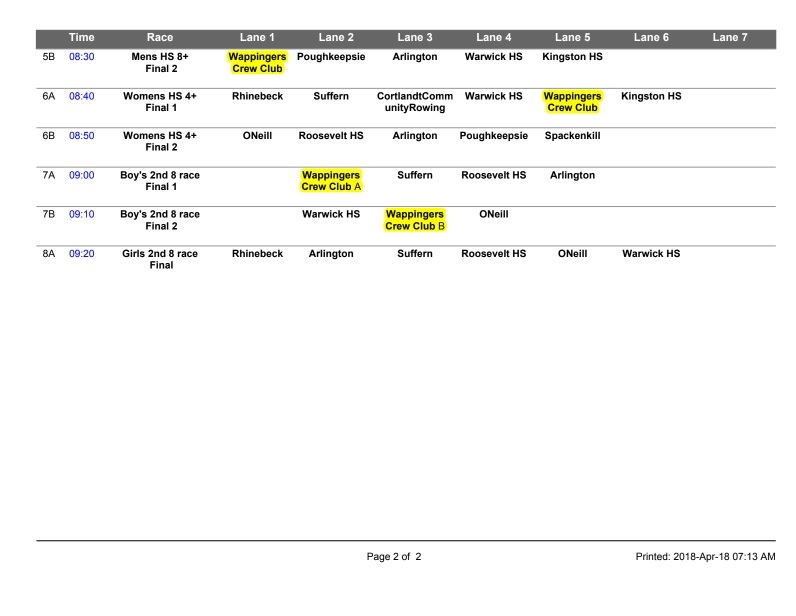 Novice Boys: Any NEW rower that has not rowed for Wappingers Crew Club Spring season. 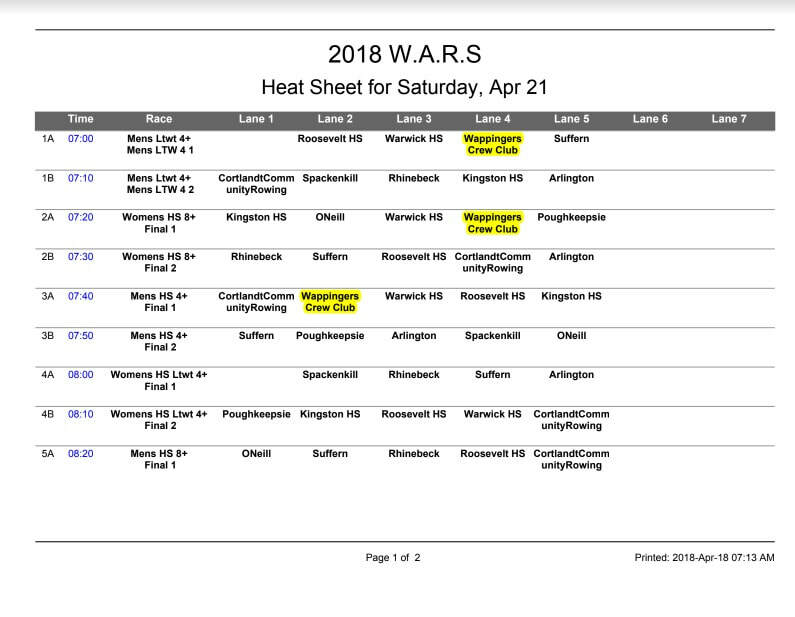 Freshman Boys: Any rower currently in 8th or 9th grade that rowed for Wappingers in the 2017 Spring season. Varsity Boys: Any rower currently in 10th grade or higher that rowed for Wappingers in the 2017 Spring season. Novice Girls: Any NEW rower that has not rowed for Wappingers Crew Club Spring season. Varsity Girls: Any rower that has rowed for Wappingers in the 2017 Spring Season. Save the date and help spread the word. Outback SteakHouse will donate 15% of your total bill. Every little bit helps the club. Click picture to R.S.V.P. Thanks. Melissa Foote will be donating her profits to the Wappingers Crew Club-25%. Please share the shopping link with your friends and family. If anyone decides to do their own party she will donate $25 to the Wappingers Crew Club. All orders must be submitted online by 11/19/17 at 8 PM. ​​"Wappingers Crew Club Annual Fall Clothing Drive"
​Combined practice and loading equipment onto the trailer and bringing back to the boathouse. Complete On-Line registration. Bring in printed paperwork and payment. SignUpGenius for the food trailer. pictures for rowers that missed it. PLEASE NOTE: Because of peanut allergies, ALL of our bake sale items need to be PEANUT FREE for John Jay. Please sign up for what you will be making for the School Bake Sales. Click Picture to sign up. Rowers, please check with your coach for the time they want you there. Memory Makers will be at the Boathouse during practice to take Team and Individual pictures. Wappingers, Arlington, Rhinebeck, Spackenkill (W.A.R.S.) Regatta will be held at the HRRA boathouse. Novice will not be racing but are welcome to attend. HRRA parking fees for all regattas - $20 for a season pass or $5 for a day pass. All cars including athletes and visitors. Parent Meeting held in the All purpose room at the HRRA Boathouse. The Parent T-shirts, Unisuits and WCC apparel will be handed out at this time. Save the date and help spread the word. Outback SteakHouse will donate 15% of your total bill. Every little bit helps the club. Please come out and Celebrate with Wappingers Crew Club for a Boat Naming Ceremony. Starting on Monday, March 27th, ALL practices will be held at the Boathouse. @ McCann Arena, Marist College. Starting on Monday, March 13th, ALL practices will be held at the Boathouse. ​This is the last sesion. 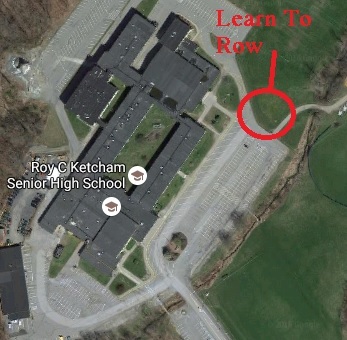 "ALL Rowers are to report to Room #215"
Parent Meeting held at Roy C. Ketcham H.S. Swim Test for ALL Novice and Fist time rowers. ALL Novice and first time rowers MUST attend. ​First Session of the Indoor Tanks practices. There is an additional charge to use the tanks so we request that each rower bring $20 to the first session. All after school activities for Tuesday January 10th have been canceled due to the pending inclement weather. Congratulations to WCC Team Captain Matt Reilly on his acceptance into Drexel University. Wappingers Crew Club annual Fall Clothing Drive. There will be a Information meeting at Roy C Ketcham HS cafeteria. Registration packets will be handed out for the upcoming spring season. Registration paperwork and payment MUST be handed in. Please meet Coach Hancock outside by the Auditorium. ​Learn To Row Parent Meeting in the John Jay HS Cafeteria. ​5/2/2016 - Congratulations Wappingers Crew! Yesterday at the O'Neill race 5 boats placed first, Boys Varsity 8, Boys 2nd Varsity 8, Boys Varsity Junior 4, Girls Varsity 8 and Girls Varsity lightweight 4, 2 boats finished second, Boys Varsity lightweight 4 and the Girls Novice 8. Two boats finished fourth, Girls Varsity 4 and Boys Novice 8. 4/28/2016 - Good luck at the race this weekend at West Point, don't forget your picture ID to show at the gate! 4/28/2016 - Yesterday both teams won the Dutchess Cup! 5 of our 6 crews either won or placed 2nd. Winners included the Boys Lightweight 4, Girls Varsity 8 and Boys Varsity 4. 2nd place finishes were posted by Girls Lightweight4 and Boys Varsity 8 which was only 0.4 seconds behind the first place team. 4/15/2016 - Tomorrow is the last day of our used clothing drive from 11am - 2pm at Guardian Self Storage, 929 Route 376 in Wappingers Falls. HRRA is holding a clean up day tomorrow from 9:30am - 12 noon to clean up the grounds of the boathouse. 4/13/2016 - We are raffling off Yankee tickets to help with the cost to repair our boats!! The raffle is for 4 Yankee tickets in the Jim Beam section behind home plate. Raffle tickets are $20 each. Click on the link below to read the description on the seats. A big thanks to the Mascia family for donating the tickets! 4/13/2016 - Tomorrow is a bake sale at John Jay, please mark all your donations "Wappingers Crew Club". 2/26/2016- Erg A Thon is at the Poughkeepsie Galleria from 10am to 4pm tomorrow. Set up is at 9am. 2/18/2016 - Tanks were originally cancelled for this Saturday are reinstated, tanks will be held from 1-3 p.m.
2/1/2016 - Parent meeting for Tuesday night will be rescheduled, if you want to drop off dues or paperwork you can stop by the John Jay cafeteria between 7-8p.m. There is a bake sale at RCK on Thursday, February 4th. Novice swim test is Wednesday February 3rd, 4 p.m. at Fishkill Allsport. 1/11/2016 - Parent meeting is Tuesday night, January 12th, John Jay High School Cafeteria 7 p.m.
11/10/2015 - Thursday November 12th is WCC Day at Buffalo Wild Wings. Buffalo Wild Wings will donate a percentage of the sales to our club if we present the coupon below, this is good anytime during the day. 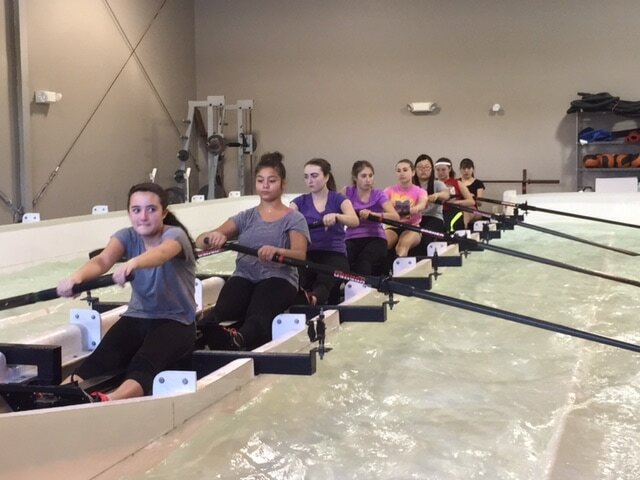 11/9/2015 - There is a parent/rower meeting this evening at 7 p.m. at John Jay High School in the cafeteria. Coaches have requested that the rowers attend. 11/4/2015 - There is a bake sale tomorrow at RCK please mark all donations "Wappingers Crew Club". The used clothing drive starts this weekend from 10:30a.m. - 1:00p.m. at Guardian Self Storage in Wappingers. 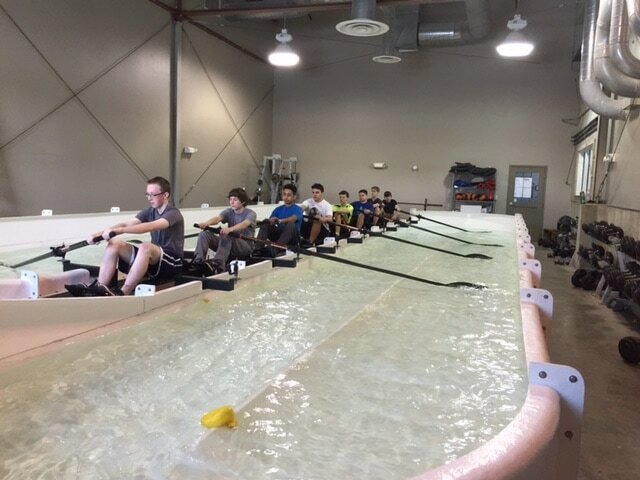 10/30/2015 - Learn to Row practices will be combined on Saturday, both boys and girls will practice from 8:00a.m. - 10:30 a.m. then we will load the boats on the trailer to be brought back to the boat house. 10/14/2015 - Spring registration is next week, October 20th at RCK High School and October 22nd at JJ High School, 7p.m. Registration forms can be found in the drop down menu "Parent Information" then click on Registration Forms. 10/12/2015 - The next clothing drive is in November. November 7, 14, 21 & 28th from 10:30 a.m. - 1:00 p.m. at the Guardian Self Storage located at 929 Route 376, Wappingers Falls. Click on the link below to bring up the flyer for all the information you need to know about the clothing drive. 9/29/2015 - Due to the impending weather for this afternoon the learn to row session has been cancelled. 9/6/2015 - There will be an informational meeting for parent/students for our Fall Learn to Row Program on Wednesday September 9th, 7 p.m. at John Jay High School in room 128. Room 128 can be found by entering the school through the entrance directly across from the flag pole. The Learn to Row Program starts next week. 5/30/2015 - At the Hudson Valley Rowing Championships Girls varsity 8 placed first and the boys combined place first. Congratulations! 5/20/2015 - Yesterday at the Dutchess Cup Regatta in Poughkeepsie, the boys won the Lightweight 4 and the Varsity 4 and placed 3rd in Varsity 8 earning enough points to WIN the Dutchess Cup team trophy for the boys! The girls took 2nd in the Varsity 8 (less than 1 second behind Poughkeepsie), took 4th in the Varsity 4 and took 5th in the Lightweight 4 earning enough points to place 3rd overall for Dutchess Cup points. Congratulations!!! 5/19/2015 - WCC continues the racing season with another weekend of successful racing! The girls 8 boat placed second in their race, the boys senior 4 boat also placed second in their race and the boys lightweight 4 boat placed third in their race at the Chargers Junior Invitational race in Syracuse on Saturday. On Sunday at the HVRL Novice Championships the girls novice 8 boat placed 2nd in their race, boys novice 8 boat placed third in their race and boys novice four boat also placed third. Congratulations!! 5/12/2015 - Another great weekend of racing at the NYS Scholastic Rowing Championships. Congratulations to our new State Champions in the Girls Jr. 8 club division. Congratulations to the Boys Lightweight 8 & Boys Junior 4 boats who claimed silver medals in the club division. 5/5/2015 - Congratulations on an AWESOME weekend of racing in Poughkeepsie! The following boats placed first: Boys Lightweight 4, Girls Novice 8, Novice Mixed 8, Girls Varsity 8, & Girls Junior 8. The following finished 2nd: Boys Jr. 4 and Boys Varsity 8. The following placed 3rd: Boys Senior 4 and Girls Lightweight 4. 4/28/2015 - Boys novice - practice ends at 6:30pm this evening. 4/27/2015 - Congratulations to all the rowers for a great race in Saratoga this weekend! The Boys Jr. 8 & Girls Varsity 8 both finished in silver medal position. The Girls Jr. 8 was 4th, less than 2 seconds from a bronze medal. The Boys Jr. 4 finished 7th out of 20 crews entered. Thanks again to the food crew for the great food, we appreciate it! 4/23/2015 - Team pictures will be taken next Wednesday, April 29th during practice. Picture information was distributed during practices this week. Rain date for team pictures is May 13th. 4/20/2015 - Congratulations for outstanding performances on the river Sunday morning in Poughkeepsie. The girls Varsity 8 won their event. The Boys Varsity 8 was 2nd, only 4/10th of a second behind Arlington. The girls Combo 8 was 1st in their heat, 3rd overall. The boys Combo 8 was 3rd in their heat, 4th overall. Great job rowers! 4/19/2015- Varsity boys, varsity girls and novice girls have no practice on Monday April 20th, novice boys have practice. 4/7/2015 - Bake sale at RCK on Thursday, April 9th. Please mark all donations "Wappingers Crew Club". Bake sale donations can be brought to the parent meeting on Wednesday evening. 4/7/2015 - Parent meeting has been moved to Wednesday, April 8th at the boathouse at 7 p.m.
3/23/15 - Varsity boy's practice for this week starts at 5:00p.m. 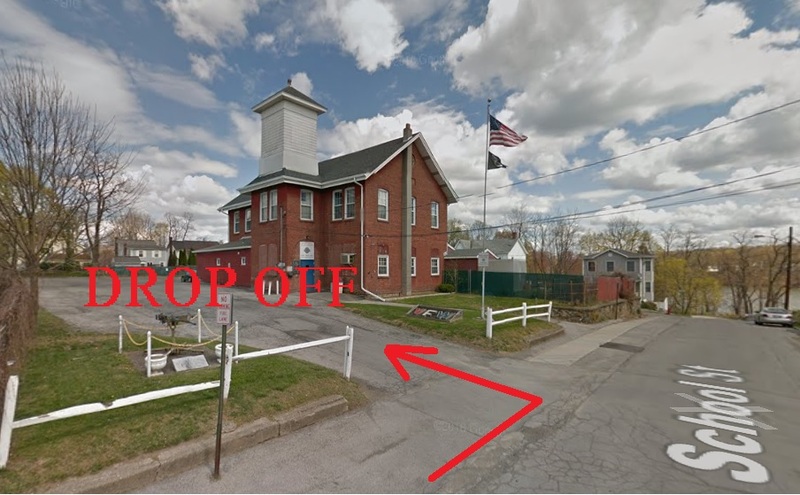 not 5:30 p.m.
3/6/2015 - If you plan on volunteering at the clothing drive tomorrow please park across the street from Guardian Self Storage. 3/4/2015 - There is no practice for varsity girls today, Wednesday, March 4. There is a bake sale at RCK tomorrow. 2/27/2015 - Next parent meeting is Monday March 2nd at RCK High School, 7 p.m. in the cafeteria. 2/24/2015- Erg A Thon is this Saturday, please e-mail wccwinning@gmail.com if you can help on Saturday. 2/19/2015 - The time frame for tanks for Saturday February 21st has been changed to 12-2 p.m. The Wappingers Crew Club has been rowing since 2004. We are an approved, parent run and funded club, operating within the Wappingers Central School District for the benefit of Wappingers Central School Students. Our club consists of dedicated athletes from John Jay and Roy C. Ketcham High Schools as well as Van Wyck and Wappingers Junior High Schools. Wappingers Crew Club "NEW" Web Based / Mobile App Software. Boys Varsity Team - 2017 Dutchess Cup Champions! Boys Varsity Team - 2016 Dutchess Cup Champions! Girls Varsity - 2017 Dutchess Cup Champions! Girls Varsity - 2016 Dutchess Cup Champions! Girls Varsity 8 - 2015 New York State Club Champions! Boy's Lightweight 8, 2015 silver medal club winners! Boy's Junior 4, 2015 silver medal club champions!